Delight diners with this fresh, colourful, yet low calorie creation. This Asian-inspired recipe blends the tastes of lemongrass, cilantro, wing bean, shallot, ginger, and beef – then serves it all up in a coconut for bonus presentation points. Place beef tripe in a large stockpot covered with water, add salt, ginger and lemongrass and bring to a boil. Gently simmer until the beef tripe is very tender for about 2 hours. Remove the beef tripe from the pot and place on a strainer. Then, rinse the beef tripe under cold runner water. Set aside. After cooling, slice the beef tripe to julienne. 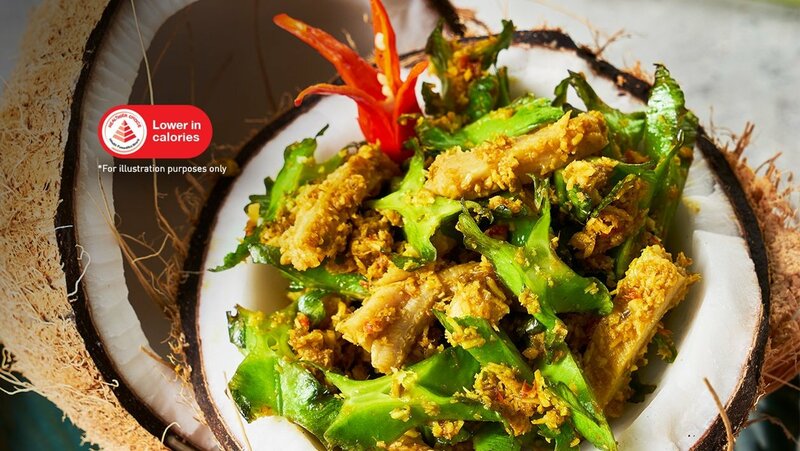 In a frying pan, heat oil and sauté the Knorr South-East Asian Spice Paste and fried shrimp paste till fragrant. Then, add the grated coconut and mix well for few minutes. Season with salt and pepper to taste and set aside to cool. In a mixing bowl, add in the julienne beef tripe, wing bean, Knorr Concentrated Chicken Bouillon, fried shallot, cilantro and the cooked grated coconut paste. Toss and mix well and serve. Garnish with fresh cilantro leaf as needed.